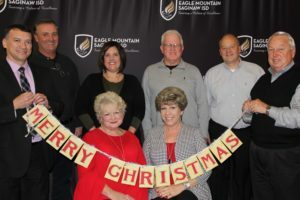 As a 501 (c)(3) organization, the Eagle Mountain-Saginaw Foundation is governed by a volunteer Board of Directors composed of up to 31 professional and business leaders and retirees. Many have strong ties to the community, and all of whom have a great love for the District, it’s students, faculty, and programs. The Board of Directors meets monthly, except in July. Serving on the Foundation’s Board of Directors requires a personal commitment to participate and contribute to the effectiveness of the Foundation. The Executive Committee is composed of five Directors; Chairman, Vice-Chairman, Secretary, Treasurer and one Director at large as well as the Foundation Executive Director.